What an awesome, empowering promise from our Heavenly Father. This scripture has been my life verse, and many many times I have clung to it like a life raft in a storm. Being tossed and thrown about, I have held strong and cried out for God to calm the storm. After all, He promises it will all be good, right? But in truth, sometimes everything is not good. Sometimes we lose, sometimes we fail, sometimes the relationship is not mended and reconciled, sometimes the job goes to someone else, sometimes the bills can’t be paid, sometimes the biopsy is malignant, sometimes the surgery is not successful, sometimes…. our prayers are not answered. Sometimes – often times – it is not all good. As children of God, what we need to know is what God is really telling us with this promise in Romans. It is not that everything will always be good, but that when things are not good, when things are broken – when WE are broken – we need to come to Him, bring all of our brokenness, bring all the circumstances of our situation and lay all of it at His feet. We need to let go of our futile attempts to control and fix it ourselves, and really give it all over to Him, saying “here Lord, take this relationship, take this job, take these finances, take this disease, take this (whatever it is) and work it out for YOUR glory, for YOUR purpose – not my own selfish purpose, but YOUR purpose”. That is when God, lovingly scoops up all those broken pieces, forming something beautiful and making something good come of the bad, all for the kingdom’s purpose. Giving this control over to God can be most difficult for us. We know how WE want things to work out, that’s what we pray for: ‘Oh Lord, please let me get this job’; ‘Father God, we beg for your healing touch’. It’s much more difficult to pray for, to mean it, and to have faith in God working HIS will and achieving good for the kingdom. Sometimes God’s glory is revealed in the healing or the reconciliation or the new job, but sometimes God’s glory is better revealed in our faith and patient endurance and ultimately acceptance of the circumstances. Sometimes the witness that touches another’s heart isn’t that the cancer was healed. Sometimes the witness that touches another’s heart is that even though this child of God was cancer stricken, suffering painfully, they rejoiced in their Lord, they took their treatments and then stood before others – perfectly healthy others – declaring the love and mercy and compassion of our Heavenly Father. This was my brother’s testimony. Through his physical suffering he never lost faith in God, he never doubted, he never blamed God. God graciously empowered him with the strength to fight the battle and in return he was able to share his testimony of God’s love and saving grace with many others. And even though he lost his earthly battle 30 years ago, to this day I am still told of the legacy of his witness from those who heard his testimony all those years ago as a teen. 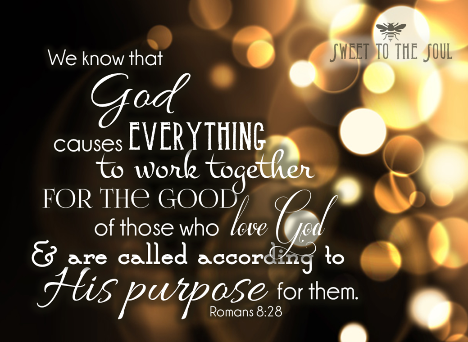 If all these years later, God is still working “things together for good” for the kingdom's purpose from a teenager’s faithfulness, know that He can and will do the same today with our faithfulness. This verse was a staple in our children's ministry during a pretty tough church divide. I was prayerfully seeking a way to bring unity to our volunteers during an unstable time. We did a Romans 8:28 challenge. At the end of the challenge, all of our kids and volunteers had this verse memorized heart deep and we had a heck of a water fight in the parking lot to celebrate. It's hard to let God. It just is. Thank you for the reminder that his way is best, even when I don't understand how he can possibly be using hardship to glorify his purpose.